K-State Family Day Open House at the Beach Museum, Saturday, September 15, 11 a.m.-4 p.m.
Hey students bring your parents on K-State Family Day to see how color wood block printing is done! 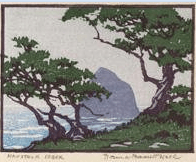 During the 1920s Norma Bassett Hall began producing color woodcuts prints, employing Japanese printing method that had been embraced by artists associated with the Arts and Crafts movement. Owl on a Pine Bough, a set of study prints in the the style of Japanese printmaker Utagawa (Ando) Hiroshige donated to the Beach Museum of Art by Jon and Ruth Ann Wefald, demonstrates each step of the color wood block process that Bassett Hall used. In addition, there will be wood blocks, printing tools, and videos available showing print making techniques. This display complements our current exhibition, Chipping the Block, Painting the Silk: The Art of Norma Bassett Hall. Also on display: The Common Work of Art, chosen to complement K-State’s Common book, The Hate U Give by Angie Thomas.